G-Floor® Imaged Parking Pad. 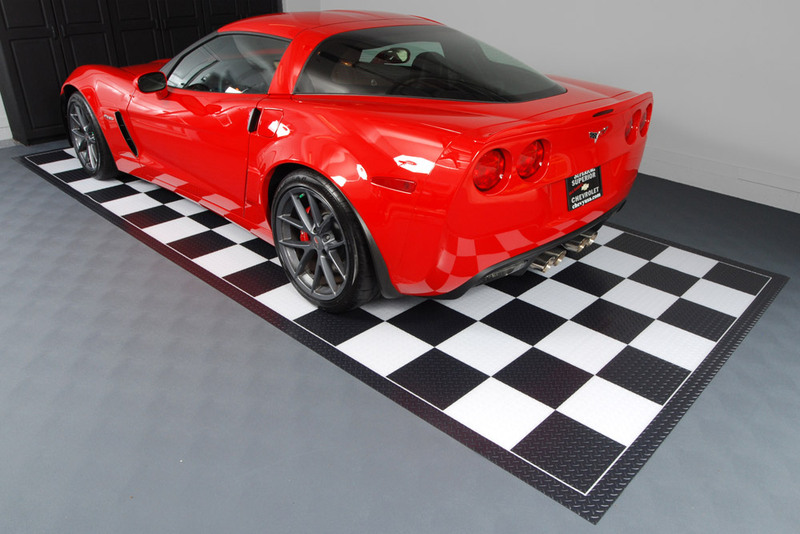 55 Mil wear layer, Black and White checkerboard design underneath a durable high gloss topcoat. Ceramic textured in 3 sizes, 2 border options in a Black or Red Border. Made from the highest quality materials for maximum durability and strength under heavy use and extreme temperature and weather conditions. These vinyl floor rolls offer other great features: • 100% Polyvinyl • Durable: Strong enough to drive a car on, yet cushions for anti-fatigue benefits • Cost Effective • DIY unroll installation (recommend taping the ends of the mat) • DIY cleaning and maintenance • Waterproof barrier to protect floors from mold and mildew deterioration • Also resists oil, battery acid, brake fluid, mud, salt, antifreeze & other common chemicals • Slip-resistant • No peeling, cracking or curling • Easy to move • Insulates and reduces noise • Hides sub-floor imperfections.